Quick and easy to put in. Can be painted or stained. For straight or curved edges. Pressure treated for long life. Available in 11 heights. Guarantee all pressure impregnated against rot. FSC certified timber. Sizes Available: 5" (125mm) high, 6" (150mm) high, 7" (180mm) high, 8" (200mm) high, 9" (225mm) high, 10.5" (270mm) high, 12" (300mm) high, 15" (375mm) high, 18" (450mm) high log roll, 24" (600mm) high log roll. 26" (660mm) high log roll. All these rolls are 1.8 metres (6 feet) long. These log rolls are top quality and cut from 70mm timber. These log rolls are top quality and cut from 70mm pressure trested timber. These log rolls are top quality and cut from 70mm FSC timber. New height log roll for this season. New extra high log roll for this season. 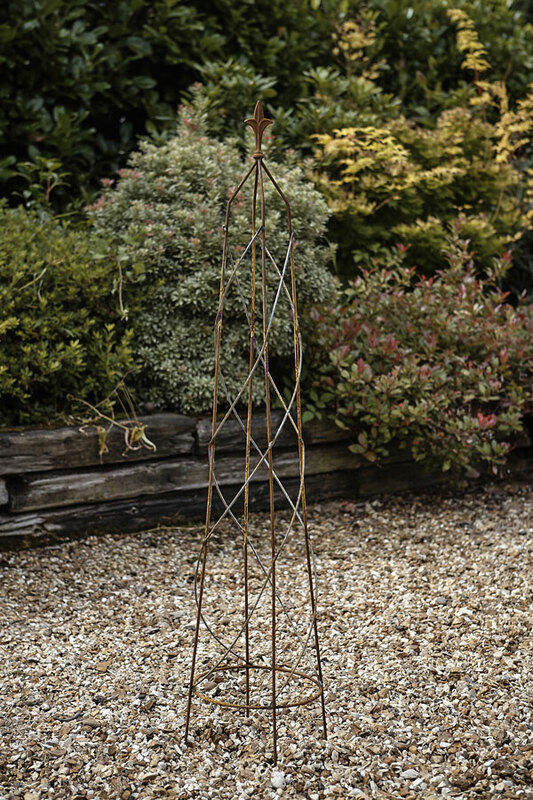 These log roll galvanised metal stakes are ideal to securely fix log roll edging up to the height of 30cm. 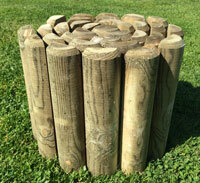 These new length of log rolls measuring 2.4 metres is long enough to tackle larger garden design ideas this timber log roll will help you to design your garden like the professional garden designers. These 2.4m long natural half log edging will transform your landscaping if used as a lawn edger, path edging or as support for raised garden beds. 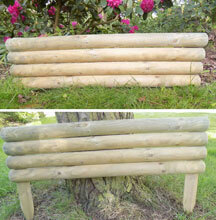 Wooden log roll will compliment any style of garden design. 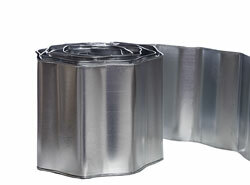 These 2400mm log rolls come in 6" (150mm), 9" (225mm) and 12" (300mm) heights. This garden edging will transform your garden designs using this garden border roll, a natural product made to enhance your landscape. Being flexible, it enables you to follow the curves suggested in your front garden design, or to install decorative edging to your garden borders. Garden edging logs are compatible with any style of garden landscaping, while edging your lawn or garden border makes garden maintenance easier. Size: 6" (150mm) high x 7.9' (2400mm) length. Size: 8" (200mm) high x 7.9' (2400mm) length. Size: 9" (225mm) high x 7.9' (2400mm) length. Size: 12" (300mm) high x 7.9' (2400mm) length. 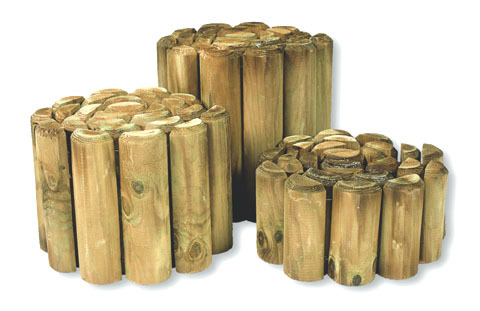 Fragment: These new sizes of log rolls measuring 1 metre long, ideal for the smaller garden design ideas this timber log roll will help you to design your garden like the professional garden designers. These 1m long natural half log edging which is cut from 70mm log will transform your landscaping if used as a lawn edger, path edging or as support for raised garden beds. 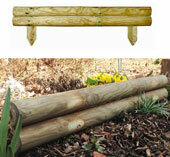 Wooden log roll which has been pressure treated to prevent rotting will compliment any style of garden design. These 1000mm in length log rolls come in 6" (150mm), 9" (225mm) and 12" (300mm) heights. 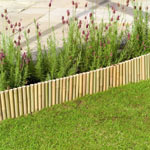 This 1m in length log roll garden edging will transform your garden designs using this garden border roll, a natural product made to enhance your landscape. Being flexible, it enables you to follow the curves suggested in your front garden design, or to install decorative edging to your garden borders. 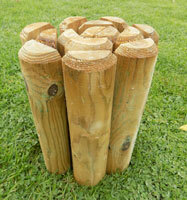 This garden edging logs roll is cut from 7cm log to produce a half moon shaped log edging. Edging your lawn or garden border makes garden maintenance easier. Log edging roll can be held securely by use of our log roll stakes which come with pre-drilled holes to allow to be attached to the rear of the log roll by either using screws or galvanised nails. Another way to hold the log rolls in place would be simply to dig a shallow trench in the earth place the log roll edging in and then back fill with the soil and compact down. These horizontal garden log edging boards are cut from 70mm diameter round FSC timber which has been pressure treated to prevent rotting. Ideal way to create a strong and natural looking garden borders and pathways. Height: 5.5" (13.5cm) - When installed into the ground. Made from FSC pressure treated timber. Height: 8.5" (21cm) - When installed into the ground. 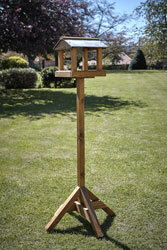 Height: 11" (28cm) - When installed into the ground. Made from FSC pressure treated timber. This natural horizontal log board is a perfect edging for gardens, being sturdy enough to retain raised garden beds, and attractive enough to enhance your garden border ideas. Even small gardens can benefit from ideas for garden borders, using log panels along the edge of lawns, as path edging, or even along the bottom of garden fences. See all our wooden picket fencing. 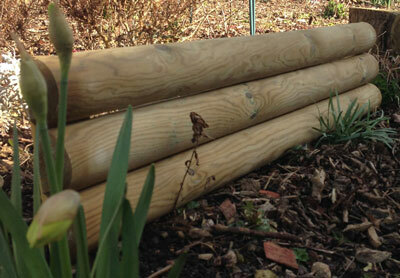 Information on how to fit wood log roll border edging around your garden borders. See our wire lawn edging. See our plastic lawn edging. 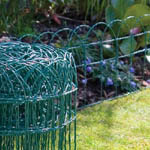 See our willow hurdles border edging. See our willow lawn edging. 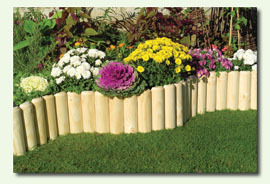 See our bamboo lawn edging. See our metal and steel edging for borders. These steel edgings are both practical and decorative soultion for path edging and edging for lawns. See our galvanised garden edge, ideal for edging lawns and path edging. 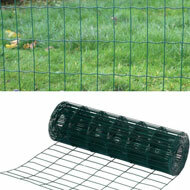 Please View our large range of Heavy Duty PVC Garden Fencing. Click on the image to view range.